"It's a fine line between a stray dog and a lone wolf." 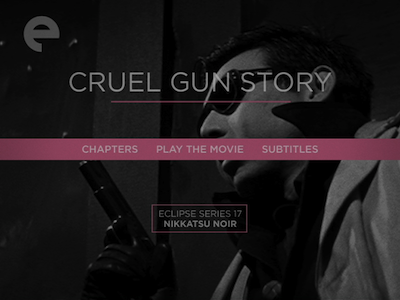 Cruel Gun Story is a weird, bald-faced title, one that gives central position to the weapon and may lead us to assume that the fate of the characters involved will be directly tied to a particular firearm, something like Kurosawa's Stray Dog or Robert Altman's short-lived 1980s television show Gun . In truth, it must be something in the translation, or maybe a case of a title testing well and being applied haphazardly to a script, because the only gun to get any singular attention here is the one bought by Joe Shishido. It's an automatic rifle that was taken off an American G.I. and it comes with a warning: if you aim it, be prepared to kill; one pull of the trigger, and the target will have seven holes in his chest. Many men fall by ending up on the wrong side of its muzzle. 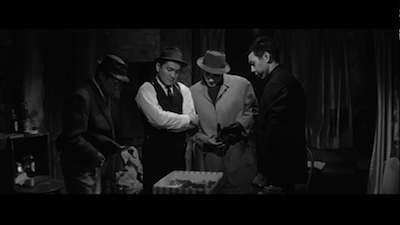 Cruel Gun Story was made in 1964 by director Takumi Furukawa (Season of the Sun), and it borrows its premise from Stanley Kubrick's hard-bitten noir The Killing. 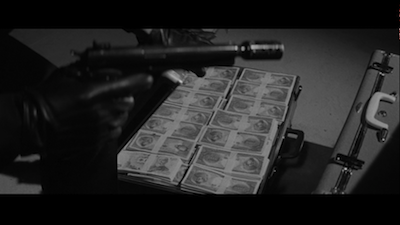 Four guys working for the mob are set up to rob an armored car carrying loot from a racetrack. The heist will be led by Togawa (Shishido), a convict fresh out of prison. 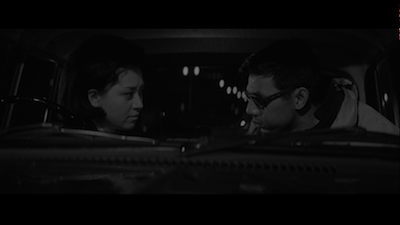 He was serving a bid for crippling a careless truck driver who had run over his sister Rie (Chieko Matsubara, Tokyo Drifter [review]). Togawa wants to go straight, but the big score promised by this job could mean an operation to save Rie's legs. Though the doctors tell him it's futile, Togawa is a man who goes against destiny. Joining him for the robbery is his old ally Shirai (Yuji Odaka), whom Togawa trusts implicitly, and two hoods forced on them by their backers. One is a punchy ex-boxer (Shobun Inoue), the other a junkie gambler (Saburo Hiromatsu, Take Aim at the Police Van [review]). The job is simplicity itself: divert the truck from its routine, and the guards will make a stupid mistake. It's Criss Cross married to The Italian Job : use a roadblock to send the vehicle down the wrong path, load it into a bigger truck, and take it away. Of course, nothing ever goes as planned, and not only do the guys get the truck, but they end up kidnapping the two guards. They also are on their way to a several double-crosses, both within their ranks and beyond them. The crooked lawyer who hired them and the mob boss who put him up to it never intended to split the money with Togawa's gang, and the lawyer even has some ideas about setting up his own organization. The body count is going to get fairly high--there are two massive shootouts before Cruel Gun Story is through--and naturally there is an ironic twist of fate just waiting to happen. 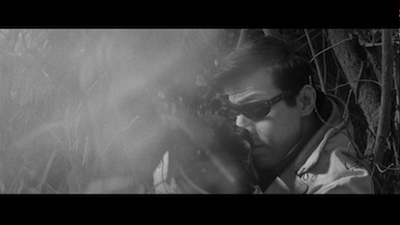 The action in Cruel Gun Story is exciting, and the narrative keeps cracking at a quick pace, preventing the film from ever settling too long. There are a few logic problems in the story--when Togawa is about to get the shaft, it never makes sense that he's willing to go to a hotel for the night and leave the others back at the hideout with the loot--and though it's neat to see the heist planning in the ideal form (how Togawa imagines it will go), the actual theft doesn't divert enough from the fantasy to really justify that early run-through. 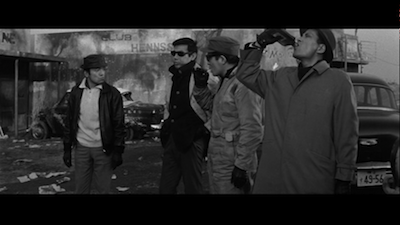 Those nitpicks aside, Furukawa has put together a stylish, tough-minded crime movie with a subtle layer of social commentary. 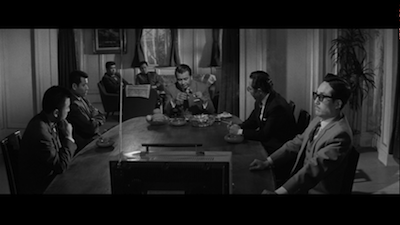 All of the crooks have some kind of difficulty, either personal or socio-economic, compelling them to take this drastic action, and the implication is that post-War Japan doesn't offer them an alternative to solve their problems. It's telling that all of their hiding places are buildings that have been ruined by occupying American soldiers, and the one guy who has been making a clean living, Togawa's friend Takizawa (Tamio Kawachi, Black Sun [review]), does so by running a jazz bar catering to black American soldiers. Even the greater cosmic forces have a Western face. Rie is in a Christian hospital, and in one of Cruel Gun Story's most potent scenes, Togawa rejects God for being callous and unforgiving. These are desperate times, and as the saying goes, desperate measures are called for. Shishido is perfecting the tough-guy swagger that he is best known for (he rarely takes off those sunglasses), but he also plays Togawa as conflicted and vulnerable. He doesn't want to pull this robbery. His instincts tell him it's the wrong thing to be doing and he's doing it with the wrong people; yet, he blames himself for Rie losing her legs because he sent her out to the store the night she was struck down. In a sense, she's like the maguffin of his particular story, though the reward is emotional rather than monetary. It makes Togawa's choice to go after the boss' own flesh and blood, the thing he cares about the most, all the more chilling. He knows exactly what kind of damage that will do. Cruel Gun Story isn't without its levity, either. It's hilarious how much these guys beat up on each other as a standard course of business. There was actually supposed to be a fifth robber (Hiroshi Kondo), but after Togawa and Shirai pretend to be rival gang members and beat the crap out of him, he folds. They also rumble with the boxer and pull a drive-by on the gambler, all to test their mettle. And any time someone talks back to Togawa, he pastes them hard on the mouth. All the guys bounce back, though, even if the furniture does not. The final act of Cruel Gun Story shows Togawa trying to salvage things and get back at the men who betrayed him. It's violent and smart and not without its bittersweet ironies. The final shot definitely owes a tip of the cap to the ending of The Killing, but not before one last dirty twist on the part of the filmmakers, giving Togawa one further disappointment to chew on. The last act of violence perpetrated in the movie is done because someone mistakes him for being their mutual enemy, suggesting that in a world that's gone this wrong, the ultimate cruelty is for a man to become everything he hates.